Redone as the inconsistent Quarantine, we go back to the source with 2007’s Spanish-made REC. Both films feature identical stories. REC presents a TV news team that follows a fire crew. Reporter Angela Vidal (Manuela Velasco) and cameraman Pablo (Pablo Rosso) concentrate on firefighters Manu (Ferran Terraza) and Alex (David Vert). After a slow night, they finally get a call for a medical emergency in an apartment building. Mrs. Izquierdo (Martha Carbonell) has been acting erratically, and her oddness takes a dark turn when she chomps on a cop. This sets a lot of freaky events into play, and the folks in the building end up locked inside by the authorities. We follow the terror that follows as plenty of mayhem ensues. If you compare that synopsis to my write-up of Quarantine, you’ll see they’re virtually the same. That’s because the two movies are virtually identical. Oh, the American version adds a bit more character development, so we get to know the firefighters better. Nonetheless, eliminate the language differences and you’ll essentially have the same movie. Since I watched Quarantine first, this factor had a negative impact on my enjoyment of REC. I initially viewed REC only been about five months after I watched the remake, so I remembered the latter well. If I’d waited a few years, my memories might’ve faded enough to allow REC to seem fresh, but after a mere five months, I experienced a whole lot of déjà vu. Which certainly isn’t the fault of those who made REC. Indeed, if I’d watched them in the order of their creation/theatrical release, Quarantine would’ve been the redundant one. Obviously the American filmmakers took the original material and essentially just copied it. Yes, they changed some elements, but the fact remains that they didn’t exactly reinvent that particular wheel. Perhaps this means my comments about Quarantine should apply here, as I enjoyed the remake more than the original because of the surprise factor. Like most horror movies, REC requires a certain level of shock to work, so when you know where the scares will occur, the film loses a lot of its strength. And since both movies used identical fright tactics – all at virtually the same moments – I was never caught off-guard by REC. Again, this isn’t the fault of the REC filmmakers since they invented the thing. But it does mean that the positives I took from Quarantine should also apply to REC - if I’d seen it first. I find it hard to judge the original film due to this lack of surprise, but I’m sure it works just as well – if not better – than the remake. Neither gives us anything particularly unique in the world of zombie flicks. The “on the fly”/semi-real time photography gives the material a moderate spin, though that technique is getting old. I liked it in Cloverfield and think it can work, but it’s becoming a case of diminishing returns. It’s no longer especially creative, and the flaws that come with the format seem more obvious. One notable problem for some: motion sickness. Though both are handheld, I think REC seems even jerkier than Quarantine. While I’m susceptible to motion sickness on the big screen, I’m usually fine at home. However, REC gave me a bit of a headache, so if motion sickness is a concern for you, beware. Objectively, REC does offer a pretty good horror experience. The film plays in a reasonably real way, as the actors fill their roles well and keep us in the moment. The super-jerky camerawork becomes a distraction. Even in these circumstances, shouldn’t a professional cameraman have better control? Nonetheless, the techniques add some urgency to matters and draw us into the material. If you like horror flicks and never saw Quarantine, then REC is definitely worth a look. If you did already view the remake, though, you probably won’t get much from the original. The two movies are just too similar for both to become enjoyable. REC appears in an aspect ratio of approximately 1.85:1 on this Blu-ray Disc. Shot on consumer-grade DV cameras, REC didn’t dazzle, but it looked fine given its constraints. Inevitably, sharpness took a hit due to the nature of the cameras as well as the style of photography. The “on the fly” techniques left us with a lot of intentionally soft elements. At best, the image could seem fairly well-defined, as more sedate shots brought reasonable delineation. Given the source, nothing ever came across as rock-solid, but the material showed appropriate sharpness. No edge enhancement appeared, and the movie suffered from no moiré effects or jagged edges. No source flaws occurred, though the film took on a grainy appearance due to the filming conditions. Colors were lackluster, though they were fine given the shooting circumstances. The movie took on a dull brown tone much of the time, and that was an artifact of the video shots and the bland apartment complex setting. The disc didn’t have many opportunities to demonstrate different hues, so they remained ordinary. Blacks were also mediocre, as those elements appeared somewhat flat. Shadows were erratic and usually seemed somewhat dense and thick. Again, much of this reflected the shooting conditions, so most of the concerns were inevitable. Given the nature of the source, I thought this was a more than acceptable presentation. Though the disc also included a dubbed English version, I went with the film’s original Spanish DTS-HD MA 5.1 soundtrack, and it seemed fine for this material. Logically the audio should’ve remained essentially monaural since it’s supposed to come from the source camera. 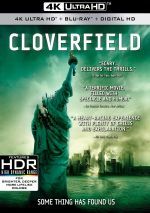 However, as was the case with Quarantine and Cloverfield, the filmmakers decided to take moderate auditory liberties and open up the soundfield. At least a little, that is, as the REC soundscape didn’t go nuts in its use of the side and rear speakers. Most of the audio focused on general ambience, so the apartment complex setting added a layer of creepiness throughout the film. Some action sequences brought out more prominent sounds, but these remained fairly subdued. There’s not a showy sequence to be found here, and that’s probably the way it should be. Audio quality seemed good, as speech was natural and concise, and effects showed acceptable range. They weren’t terribly powerful, but again, that makes sense, as really slam-bang effects could feel unnatural. The film lacked music of any sort. This soundtrack was positive enough for a “B-“. By the way, I did occasionally sample the English dub and it left me unimpressed. The lines didn’t match the mouth movements, and the voices didn’t seem right for the parts. I think the original Spanish audio is definitely the way to go. How did the Blu-ray compare to the DVD version? Audio showed a little more heft, whereas visuals demonstrated clear improvements, as the Blu-ray lost the blocky, compressed feel of the DVD. Nothing will ever make this a visual showcase, but the Blu-ray felt like a much more accurate representation of the source. The Blu-ray mixes extras from the DVD with additional components, and we open with an audio commentary from writers/directors Jaume Balaguero and Paco Plaza. Both sit together for this running, screen-specific look at photographic styles, cast and performances, sets and locations, story/characters and the loose script, various effects, editing and related domains. REC came with an unusual shoot, and Balaguero and Plaza cover it well. They get into a good mix of appropriate subjects and cover them with gusto as they make this an informative commentary. We find a featurette simply called Making of REC. It runs 40 minutes, 52 seconds and provides comments from Plaza and Balaguero. We learn about the project’s origins and story, its structure and filming techniques, sets, cast and performances, makeup effects and technical issues. The best parts of the featurette come from the behind the scenes footage, as we get some good glimpses of the shoot here. The information from the various filmmakers adds some workable material as well, and this turns into an informative show. Under Crew Interviews, we find 46 minutes, 38 seconds of remarks from Plaza, Balaguero, sound designer Oriol Tarrago, boom operator Filippo Restelli and director of photography Pablo Rosso. These look at sound design/recording and camerawork. Both topics receive good exploration in these insightful clips. Unused footage follows as we get four Deleted Scenes (3:13) and two Extended Scenes (30:05). The deleted pieces mostly just show scared characters, so they bring out nothing memorable. As for the extended shots, the first offers more interviews with the trapped apartment residents, while the second gives us a longer intro to the firefighters. The resident interviews are moderately interesting but would’ve slowed down the film too much. The longer firefighter introduction really drags and would’ve damaged the film badly. With Behind the Scenes Footage, we find 44 minutes, 27 seconds of material. As implied, this reel consists of raw video taken from the set. We already get similar material elsewhere, but this still turns into a fun collection of shots, especially since we get lots of auditions. Three trailers - one teaser, two theatrical – appear, along with six TV spots. Finally, a Still Gallery presents 58 images that mix movie shots, photos from the set and advertising. It becomes a satisfying compilation. While it doesn’t create a tremendously original and creative horror effort, REC does provide a reasonable amount of intrigue and good scares. It’s at least above average for its genre. The Blu-ray offers largely positive picture and audio along with an appealing array of bonus materials. This becomes a strong release for an entertaining horror film. As of October 2018, this REC Blu-ray can be purchased only as part of a four-film “REC Collection”. In addition to REC, it includes REC 2, REC 3: Genesis and REC 4: Apocalypse.